Watershed Assessment Model — Soil and Water Engineering Technology, Inc. The Watershed Assessment Model (WAM) was developed by SWET and has been in use by both private and public sectors for over 15 years. WAM is a Geographic Information System (GIS) based model that allows engineers and planners to interactively simulate and assess the environmental effects of various land use changes and associated land use practices within complex watersheds. WAM utilizes ESRI® ArcMap with Spatial Analyst to analyze and display model input and output. 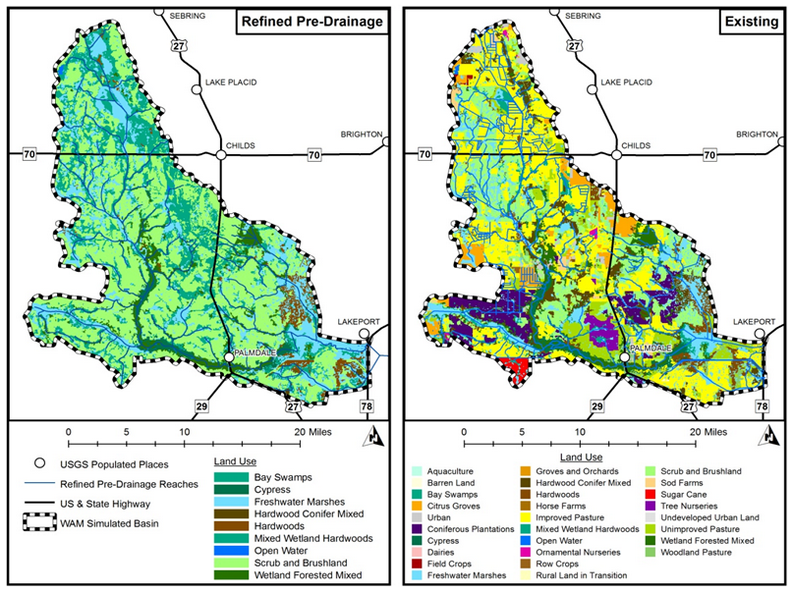 WAM has the ability to model extremely complex watersheds including agricultural/urban/native land uses, natural and channelized stream networks, looped flow networks, multiple hydraulic structures within the stream/canal system, springshed groundwater systems, and tidally influenced boundary conditions. A wide range of options or extensions are available for implementation depending on the specific application area. WAM was developed to allow users to assess water quality and quantity of both surface water and groundwater based on the detailed physical properties of the watershed and the underlying hydro-geological system. The model simulates the primary hydrologic and chemical processes at the individual field level to determine the amount of water and nutrients originating at this scale. These flows and nutrient loadings are dynamically routed throughout the stream network to its discharge location. WAM lets engineers and planners assess the water quality within a watershed by quantifying these flows and loads and evaluating the effectiveness of alternative management practices. WAM is designed to take advantage of available GIS technology in that it represents, analyzes and displays a watersheds natural processes, features and interrelations between processes and features based on the spatial location and attribute information inherent to each feature. WAM is a tool to collect, synthesize and house specific data types, classify and analyze the relationships inherent to that data, and report on any patterns that exist. It is a process based model, in that many sub-routines or processors are used depending on the stage of investigation or watershed function that is being evaluated. These sub-routines are designed to run independently from each other, but consecutive to each other, as the inputs of one routine are dependent on the output of a previous routine. The GIS interface prevents the user from requiring extensive knowledge of the sub-routine order and processes as well as the myriad of tables that store characterization data. The interface is used to setup a watershed for analysis, edit input parameters and review the output.